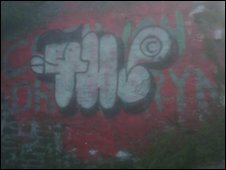 An attack on an historic piece of graffiti has been condemned by a committee set up to preserve it. The site near Aberystwyth, which is regarded as a national landmark, has been painted over, covering the words Cofiwch Dryweryn (Remember Tryweryn). They were painted on a wall in memory of a Gwynedd village, flooded to provide water for Liverpool in 1965. The wall is deteriorating and an appeal was launched last year by Cadw, the historic monuments agency, to save it. It is estimated that £80,000 will be needed to preserve the site. Heritage Minister Alun Ffred Jones helped launch the appeal at the National Eisteddfod in Bala, Gwynedd, last year. But the fund raising committee set up to secure the future of the wall said the latest attack on it highlighted its vulnerability. A spokesman said: "This mindless vandalism highlights the vulnerability of the wall and how important it is for the funds to be raised so the wall can be protected in perpetuity." The Welsh Assembly Government said it was disappointed the site had been defaced. A spokesman said: "The wall is not a protected building or monument, but we are disappointed it has been defaced given the plan to preserve, maintain and provide interpretation for it agreed at a meeting between the Minister for Heritage and the National Trust." The graffiti was originally inscribed on the gable end of a derelict cottage and has faded and been repainted several times over the decades. But it is deteriorating and has become a danger to the public. Parts of the lettering of the painted slogan are also rapidly disappearing. It was painted shortly after Tryweryn, near Bala, was flooded to provide water for Liverpool. In 2005, the city officially apologised for the flooding of the community in 1965.